i actually stopped guessing at what Sequential would be doing next because it really serves no current purpose, other than the dreaming away. Yeah, I've noticed this thread does tend to be a list of dreams as much as it is a prediction thread. If I am honest, I'd like to see all of the smaller companies just take a break from releasing a flagship every year and do something smaller. Sequential have trimmed down their line to 'boards mostly, which does reflect a market they are targeting, but also means a roomful of key for anyone hooked on Dave & Co. 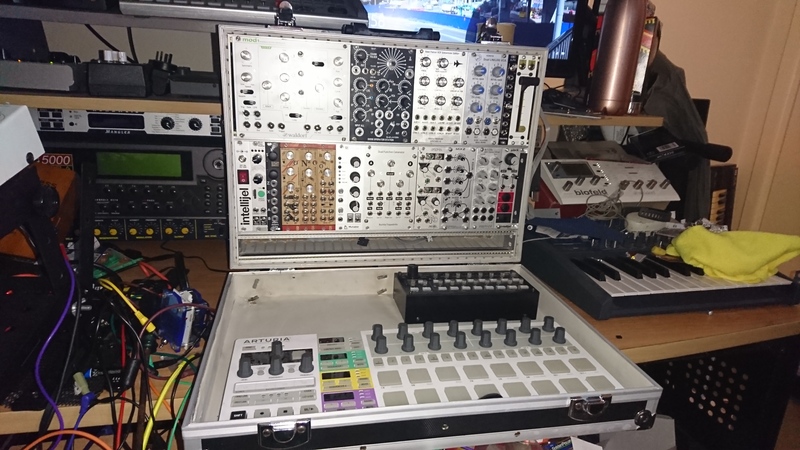 I understand that once a knobbox gets to a certain stage, it may as well have keys on it, but still yearn for an expander-style synth that can address all the finer details. Ditto. I was a great fan of DSI's earlier days when their line-up of instruments allowed you opportunities to gradually build an instrument by adding voices and such. As in Evolver Desktop, Mopho Desktop, Tetra, Evolve Rack, etc., all of which I've owned. The Mopho x4 is the last fading trace of those days. Back then, you didn't have to empty your bank account every time you made a purchase. Since those little modules were retired, I've had a difficult time buying anything at all from my favorite synthesizer company. Today I sold one of my Prophet '08 keyboards in an effort to finance a Rev2, and I still don't have enough money for it. It would be a very happy matter for some of us if DSI would again offer a broader range of instrument sizes and prices. I’d like to see an analog vocoder. I would like to see a new hybrid synth like the Prophet 12, but based on FPGAs like the PEAK. I love the sound of my PEAK very much and the recent update made it an even more fantastic synth. Someone said he would buy 3 PEAKs and a good controller keyboard instead of buying a Moog One... and I can absolutely support that. The Moog sounds very good to me... but when it comes to bang for the buck I would prefer the mentioned 3-PEAK setup. Back to topic. Even if I like my PEAK very much, I like the UI from DSI synth more. If I compare the PEAK to my Rev2 I must say there is much less menu diving on the Rev2 and dialing in modulations with the src and dest buttons is a far more quick workflow than scrolling through everything in the mod menue on the PEAK. I was very interested in the P12 also, but for my personal taste of sound it could not be compared to the PEAK and I didn't like the feel of the keys. Hopefully the next offering might bring multitimbrality to Sequential’s catalogue. Dave did say they were looking into it. I was a great fan of DSI's earlier days... Back then, you didn't have to empty your bank account every time you made a purchase. It would be a very happy matter for some of us if DSI would again offer a broader range of instrument sizes and prices. But the market has changed a lot since then. Software has gotten a lot more competitive sound-wise, and arguably superior in some ways interface-wise (especially when it also maps to a hardware controller ala Omnisphere), the pricing low end of analog/physical has been lowered even further by Korg, Roland, and Behringer who have economies of scale DSI / Sequential will never compete with, the rise of modular has taken dollars away on the upper end, etc etc. I think Dave HAS to only make high-end stuff now, to have a compelling enough offering that leverages DSI / Sequential's unique strengths and avoids the danger of going head-to-head against the strengths of the giant vendors. For example the Mopho x4 is a far superior synth IMO to the DM6, but the DM6 is more popular and makes more money for Behringer than the Mopho x4 did for DSI because the DM6 has more voices, more modulations, great effects and is still cheaper. Nevermind the cheaper build quality, inferior sound etc. The fact is for a lot of people, the DM6 is "good enough" in those areas, and has "MOAR FEATURES". So Dave has to build things that Behringer, Korg, Roland et al. never would, even if they theoretically could. Yes, I know, I know. The market has changed and Sequential has had to adapt to it. But musical needs are more of a constant. I'm 100% in favor of Sequential building large instruments and always have been. I'm hoping they'll follow up the Prophet 12 with something comparable. Still, smaller instruments/modules can be a key element in building a large musical system. Modules are essential in my own set up, especially in the bass area. I'm only dreaming, perhaps, but I do wish DSI would create a full-sized four-oscillator polyphonic synthesizer primarily with just the essentials. I see companies expanding their instruments in various directions, adding all sorts of features, but never in the direction of multiple oscillators. I'd love to have a six-oscillator poly synth, but how likely is it that we'll ever see such an instrument? The Prophet Rev2 is great, but how about something more powerful...and reasonably priced? Give me a six-oscillator twelve-voice DCO synth with long envelope times, in both keyboard and module versions, and I'll be permanently content. But musical needs are more of a constant. I don't know that they entirely are that constant. To some degree, in terms of instrumentation where you'll want *something* to fill in each register, then sure. But very, very few people play keys these days like most people did in the 70s or 80s - musicianship has shifted away from playing to composing, and people just don't have the chops that players did back in the day. The music is also different, and styles often shift and develop with new technical possibilities - ie dubstep was largely enabled by the easy to program step-envelopes of Massive and other softsynths. And while those sounds are usually filling the bass/lead functions or sometimes chords/pads, it would have been either extremely difficult if not impossible to program those on older systems, so a designer has to either keep those in mind or risk not giving the market a design it wants to buy. Obviously the retro trend of the last 5-10 years is helping sustain the older, "simpler" designs of hardware vs software, but that will cycle back out soon enough, and designers have to look to where the ball is going as much as where it is now, or else wind up upside down on their investment in a product no one really wants anymore. I did qualify my statement with the word "more." I would agree with your comments, but they only support one of my constant points: an excessive dependence on technology has badly impacted music performance and composition. Most folks here will disagree with me, I realize. I'm obviouslly expressing an opinion, and one from the angle of a very different approach to both music and synthesis. The obsession with stuff, with as much and as many gadgets as one can afford or fit in one's studio, has had its toll on music. Many people make music based on how many pieces of equipment they can squeeze into a song. An additional effect of this is an exaggerated emphasis on rhythm and beat. I would call it slavish, lacking all free rhythm to breathe. It is possible to maintain a musicality without giving in to the obsession with equipment. One doesn't have to follow the mob or swim with the rest of the fish. I'm not sure which drives which - whether it's merchandise or musicians that leads the way. I'm inclined to believe the former. But very, very few people play keys these days like most people did in the 70s or 80s - musicianship has shifted away from playing to composing, and people just don't have the chops that players did back in the day. A few minutes of searching on Youtube would say otherwise. There's plenty of channels of kids who live a life of one-upmanship. Popular music on the other hand has certainly taken a dive, but there's still plenty of bands that display an extreme level of musicianship. It's just easy these days for the average Joe to make music as anyone with a laptop can pretty much produce a track. Meaning it's a much broader field these days and much harder to break through as well. I'm sure anyone from the 18th century would say even the music that you're referring to has been immensely simplified. At the end of the day, it's all about striking an emotion with the listener and very little else matters. To get back on track, I however agree that Sequential's main niche in the market is those who still seek excellence in their instruments. It's just easy these days for the average Joe to make music as anyone with a laptop can pretty much produce a track. Yes, that's true, especially with YouTube. It's easy to appear like a star for a video, with very little musical ability but all the right equipment, as well as some camera ability. Yes, that's true, especially with YouTube. It's easy to appear like a star for a video, with very little musical ability but the right equipment. Haha that would be me! Actually I wouldn’t mind seeing more analog paraphonic synths or at least somehow have a mode or switch that turns a synth from Polyphonic to paraphonic. It really does have a unique sound to it. Has Sequential ever had a vocoder for any of their synths? Past or present? Nothing I can recall. That might be a fun feature as well. I wouldn't say so. Your videos don't seem at all vain or ostentatious to me, but to the point. I wouldn't say so. Your videos don't seem at all vain or ostentatious to me. I went to music school. Yes, there's some truth to what you say. But teachers are there to help you sharpen your musical ability...and then you never see them again. It's the same in sharpening any skill; the training period is important, and often boring, but it lasts for only a while, and then you're free to use it or not. I worked very hard at music theory, especially harmony and counterpoint. It transformed my ability, especially in the improvisation department, and I would never want to be without that knowledge. I found that it set me free, musically speaking. If you're always striving for something, but always falling short of it for lack of knowledge or ability, then you end up burning yourself out with frustration. I would say, apply yourself to music theory and keyboard exercises, even if just on your own. Don't overlook self-instruction; it's a mightily powerful option. Theory and keyboard skills won't hurt you or turn you into a cold musical scientist, like some musical Doctor Frankenstein (That reference was for you!). No, they will only expand your ability, and thus, increase your potential for finding satisfaction in your own work. Thanks! I think I'll consider it for sure! I didn't know that. Thanks for the good news, Shaw. I'd interpret it to mean they've got a new instrument ready to be announced.